To celebrate the launch of her book, Teri will be visiting 21 cities in May, June and July. Each stop will feature a special guest, product samples, giveaways and beautiful venues. Find out when you can catch Teri in your hometown and snag your ticket at her website, nocrumbsleft.net. Brighten your day with this light, lemon-y dish from Teri Turner of No Crumbs Left. This Greek Lemon Chicken is a sneek peek of No Crumbs Left: Recipes for Everyday Food Made Marvelous. 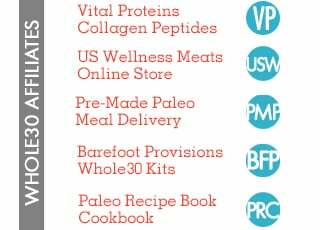 Teri’s first cookbook is Whole30 Endorsed and packed with recipes to support your Whole30 and life after. It hits the shelf of your favorite bookstore on May 21st, but you can pre-order your copy today. If Teri’s popular Instagram feed is any indicator, No Crumbs Left: Recipes for Everyday Food Made Marvelous will provide you with endless inspiration for cooking beautiful food during your Whole30 and beyond. The Athenian Room in Chicago makes the most fabulous chicken, served with thick Greek fries. Their dish got me wondering if I could create something like it and inspired me to develop my own. My smoke detector goes off nearly every time I make this, and we all run around turning on the fans and opening the windows, but it’s absolutely worth it, and even kind of fun. Nothing can replace their original version, which you should absolutely seek out if you’re in Chicago, but this healthful version is soul-satisfying. 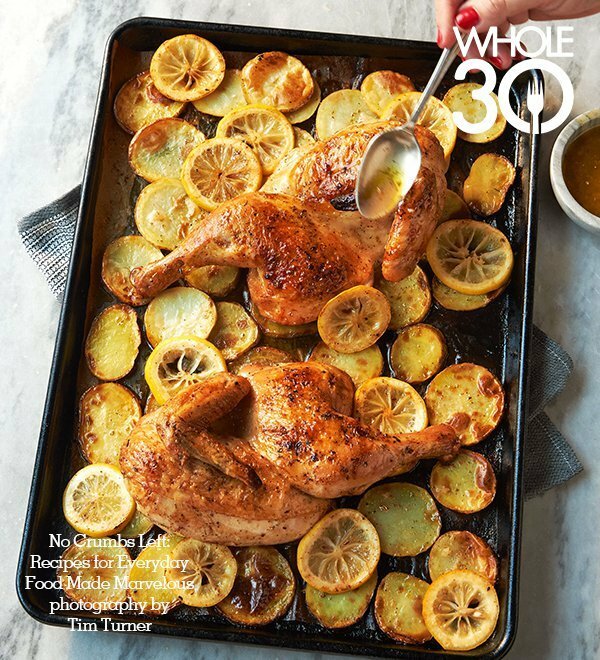 An exclusive preview of the No Crumbs Left cookbook, on the Whole30 blog today. Get the recipe for Greek Lemon Chicken. ADJUST the oven rack to 6 inches below the broiler. Preheat the oven to broil. Line a large baking sheet with parchment paper. IN a large bowl, add the lemon juice and using a whisk, slowly add the olive oil. Then add the vinegar, garlic, oregano, salt, mustard, and black pepper, stirring well. Set aside. SEASON each chicken half with the salt and black pepper, then generously rub every crevice with the olive oil. Put the chicken skin-side down on the lined baking sheet and put the pan on the adjusted rack in the oven. Broil for 15 minutes, until beginning to turn golden. REMOVE the baking sheet from the oven and flip the chicken over to the other side. Return to the oven and broil for 20 minutes more, or until cooked through, golden brown, and bubbling. REMOVE the pan from the oven and set the chicken aside. Once cool enough to handle, cut each half into 3 pieces: legs, thighs, and breasts with wings attached. Arrange the sliced potatoes and lemons on the baking sheet. Return to the oven and cook for 10 to 12 minutes, or until the potatoes and lemons begin to brown. 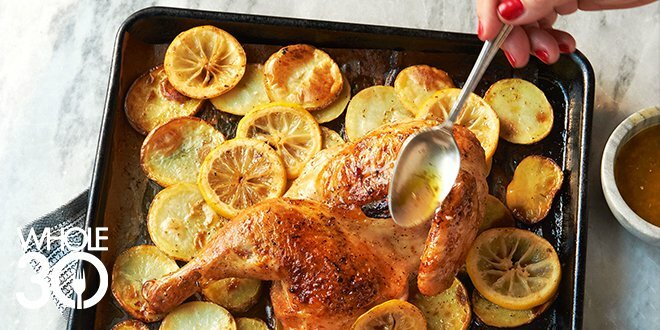 Remove the baking sheet from the oven, put the chicken on top of the potatoes and lemons, and pour ½ cup of the Lemon and Garlic Sauce evenly over the top. RETURN to the oven and broil until the chicken is further browned and crispy, about 5 minutes. Remove the chicken from the pan and drain off any excess liquid from the pan (so that the potatoes can cook to a crisp). Return the potatoes to the oven and broil until crisped and cooked through, 10 to 15 minutes more. Serve the potatoes and lemons with the chicken and the remaining Lemon and Garlic Sauce, either poured over the top or as a dipping sauce. No Crumbs Left: Recipes for Everyday Food Made Marvelous will be published on May 21, 2019 and is available for pre-order today. Click here to pre-order your copy, and get ready to celebrate your food freedom with more family-friendly recipes!  This post contains affiliate links, which means we make a small commission from purchases made via the link. 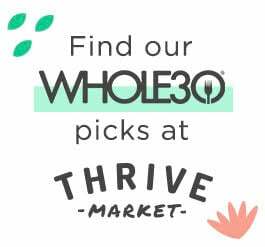 Thank you for supporting our Whole30 partners! Greek Lemon Chicken is excerpted from No Crumbs Left: Recipes for Everyday Food Made Marvelous© 2019 by Teri Turner LLC. Photography © 2019 by Tim Turner. Reproduced by permission of Houghton Mifflin Harcourt. All rights reserved.